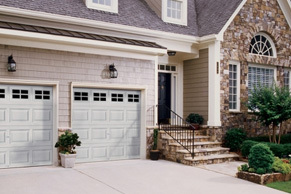 Boost your curb appeal with brands like Clopay® from the garage door company you trust! Whether you’re in the market for a new garage door or it needs a simple repair, trust our experts to find you an affordable and quick solution. We have the options to help improve the look and functionality of your entry door with professional repairs and installations. 5 Star Rated Service - Every Time! Our garage door repair service technicians are committed to providing you with safe products and premium customer service. Town & Country Door, LLC, Oakland county's largest garage door service company, is an honest and friendly family-owned business. We provide reliable garage door installation and repair services in the Metro Detroit area, specializing in broken springs and cables. Our selection of garage doors contains something for each of our customers’ price ranges, styles and sizes needed. We offer a variety of color palettes and styles that are perfect for enhancing the curb appeal of your home. They are insulated, weather-guarded and bottom sealed so your belongings inside remain undisturbed and dry. If you’re feeling a draft around your entry door or it’s visibly damaged-it’s time for a new entry door to be installed. At Town & Country Door, LLC, we can install a new entry door in your home quickly and efficiently. From various styles and designs to materials, our team can help you choose the perfect door for your home’s aesthetic. Town & Country Door, LLC would like to thank you for giving us the opportunity to serve you in our local community of Metro Detroit. The US Commerce Association Award Program recognizes outstanding local businesses that serve their local market. Each year, the organization identifies companies that it believes to have achieved exceptional marketing success in their local community and business category. We are honored to be among local companies that enhance the positive image of small business through service to their customers and community. We also have been recognized with Best of HomeAdvisor, Angie’s List Super Service and Best of Bloomfield Hills awards. To request a garage door repair or installation quote, contact Town & Country Door, LLC today. We look forward to being of service!